I certainly don’t want to jinx myself, so I am not 100% sold on the idea of putting any goals, much less ten, in print. But since one of my resolutions is to have more perseverance, moxie and Dauntlessness, I shall. 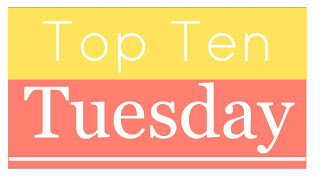 This week’s Top Ten, brought to you by The Broke and the Bookish, is my list of goals (in no particular order). Post every day this year. That’s 365 reviews, challenges, memes and exquisite bon mots from me to you. Unless it’s a leap year, then I can’t do it. That’s would be excessive. Take part in ten different book challenges this year. I really enjoy these – they are a nice break from the everyday reviews. Let me know if you have any favorites that you can recommend. I have signed up for two already: the 2013 New Adult Reading Challenge hosted by A Tapestry of Words, Confessions of a Twenty Something Fiction Writer, Tater’s Tall Tales and Basia’s Bookshelf; and Take Control of Your TBR Pile hosted by Kimba the Caffeinated Book Reviewer. Make more bookish pals online. When I had my remodeling business (that I just closed last month – *sniff*), I had a lot of friends from Twitter that were in all sorts of related fields from design to architecture to trades. It was nice to feel a sense of camaraderie in spite of us all living far from each other or never meeting in person. I hope to be able to do that with my blogging and writing career as well. Take a creative writing class. I participated in NaNoWriMo for the first time ever this past November and it was AWESOME. It really made me want to get better at fiction writing, so I’d like to take some classes or find some help in accomplishing this goal. And speaking of…I loved NaNoWriMo. It gave me that kick start that I needed to just get something down on paper. Fab. And now that the holidays are over and the kid is starting school again, I will be continuing to write on that project. I want to participate again in 2013. Help to get the word out about new writers that I like. I love social media and love to promote things I like! I’d also like to do more giveaways and my INKlings interviews. Return to the Austin Teen Book Festival. I loved this festival last year. I know it is going to be one of those that just gets bigger every year, so you might want to take advantage now. They already have big names that come, and you have an amazing amount of access to these wonderful authors. Check it out for next year here. Read more ARCs and new books. I read so many great books in 2012, but I did feel like I was playing catch up on some of the series. I’d like to read more books before they come out or at least early in the game so I can promote those I love (see #6). Be able to attend more conventions, conferences and events. I want to find more places where I can discover new books and authors or meet established writers and blog about these happenings. Find more awesome and fun memes (like this one!). Sometimes my brain hurts from writing reviews, and it’s nice to do some off-the-cuff writing where it’s all me. What are your goals for this year? Let me know in the comments! Nice to catch up with another Texas blogger. I’m in Houston. Glad you enjoyed NaNoWrimo. It’s quite a crazy month when it rolls around every year. Loved reading your list, too. Happy reading! Did you participate in NaNoWriMo? I did love it, but I finished…perhaps I wouldn’t have if I didn’t…nah, I think I still would have gotten a lot out of the experience. Any good book doins in Houston this year? Loving these goals for inspiration! I love reading challenges too and plan on doing about 10 of them which I’ll be posting tomorrow. Not sure if you know about A Novel Challenge but you can find lists of challenges there. Cool! Thanks for the link – I do know about them, and I follow them, but I couldn’t remember the name…thanks for telling me! Thanks for commenting, Tanya! Have a great rest of the week! I was blown away from your first goal, I couldn’t imagine blogging every single day of the year! I wish you luck with that, as well as making some book blog friends, and pretty much all your goals. Good luck! Houston is a pretty decent book town depending on what you’re looking for. Lit community is solid due to the UofH creative writing program and a couple of the bookstores. There are strong mystery and romance writing communities, too. Sci fi is here but they tend to not be too obvious and can be a little hard to find sometimes. Huge YA and children’s book community thanks to a very strong and vibrant SCBWI chapter. So, yeah, there’s a lot going on…. If you get a chance, attend the Texas TLA. That is a huge deal with plenty of authors, publishers and books. Cool! Thanks for all of the ideas! You and your mom have a great week! English was always my best subject, but I thought I would have to teach if I majored in it. Wish I’d taken more English/writing classes in college. Have to learn as I go now! Thanks for your comments! I don’t know if it’s just me, but it seems tougher to make friends in the book blogging world than in my previous world of remodeling. Maybe because there’s more direct “competition?” I don’t know. I have slowly made some friends with bloggers and authors alike, but it’s not quick and easy! I love the TTT meme a lot. I don’t do WoW because I don’t know what I am waiting for! I also do The Sunday Post which is a nice round-up of what you’ve posted & done the past week and what you plan on doing the next. I made a meme that was on Saturdays (but next week will start on Mondays) called Songs of the Week. I like to post what music I listened to and was inspired by that week. There’s also one on Fridays called Feature and Follow Fridays that I have done a few times. Let me know if you find any cool ones! I will look at yours as well. Best wishes on achieving your goals this year. I signed up for my first two challenges, Where are you reading? And Foodies read. Interesting challenges. I have seen the one about reading a book per state before, so I wonder if there’s a list that tells where they all take place?